Manticore is a next-generation binary analysis tool with a simple yet powerful API for symbolic execution, taint analysis, and instrumentation. Using Manticore one can identify ‘interesting’ code locations and deduce inputs that reach them. This can generate inputs for improved test coverage, or quickly lead execution to a vulnerability. Reverse engineering 200 executables in order to extract strings one at a time takes a significant amount of time. This challenge necessitates automation. As CTFs feature more of these challenges, modern tools will be required to remain competitive. We’ll be combining the powers of two such tools –Binary Ninja and Manticore– in three different solutions to showcase how you can apply them in your own work. The Magic binaries have a simple structure. There is a main function that prompts for the key, reads from stdin, runs the checker function, and then prints out the sum. The checker function loads bytes of the input string one at a time and calls a function to check each character. The character-checking functions do a comparison against a fixed character value. If it matches, the function returns a value to be summed, if it does not, the program exits. Manticore’s API is very straight forward. We will use hooks to call functions when instructions are reached, the CPU class to access registers, and the solver. The workflow involves loading a binary by providing the path and adding analysis hooks on instructions in that binary. After that, you run Manticore. As the addresses are reached, your hooks are executed, and you can reason about the state of the program. Functions defined as hooks take a single parameter: state. The state contains functionality to create symbolic values or buffers, solve for symbolic values, and abandon paths. It also contains a member, cpu, which holds the state of the registers, and allows the reading and writing of memory and registers. There are many ways to solve Magic. We’ll present three methods to demonstrate the flexibility of Manticore. A symbolic solution that hooks every instruction in order to discover where the character-checking functions are. When Manticore is at a character-checking function, it sets hooks to solve for the necessary value. A concrete solution that hooks the address of each character-checking function and simply reads the value from the opcodes. A symbolic solution that hooks the address of each character-checking function and solves for the value. This is not an exhaustive list of the approaches you could take with Manticore. There is a saying, ‘there are many ways to skin a cat;’ Manticore is a cat-skinning machine. Function addresses will be extracted using Binary Ninja. All strategies require an address for the terminating hook that prints out the solution. The latter two strategies need the addresses of the character-checking functions. In order to extract the character-checking functions’ addresses, as well as the end_hook() address, we will be using Binary Ninja. 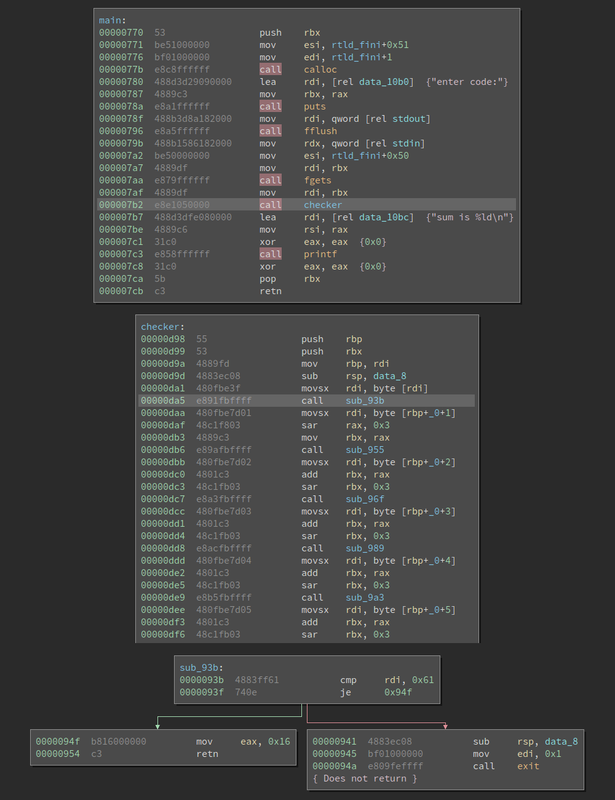 Binary Ninja is a reverse engineering platform made for the fast-paced CTF environment. It’s user friendly and has powerful analysis features. We will use its API to locate the addresses we want. Loading the file in the Binary Ninja API is very straight forward. To reach the checker function, we first need the executable’s main function. We start by retrieving the entry block of the program’s entry function. We know the address of main is loaded in the 11th instruction of the LLIL. From that instruction we do a sanity check that it is a constant being loaded into RDI, then extract the constant (main’s address). Calling get_function_at() with main’s address gives the main function to be returned. The get_checker() function is similar to get_main(). It locates the address of the checker function which is called from main. Then it loads the function at that address and returns it. Each character-checking function has identical instructions. This means we can examine the opcodes and use them as an indication of when we’ve reached a target function. We like this solution for situations in which we might not necessarily know where we need to set hooks but can identify when we’ve arrived. Set a hook on every instruction. Check if the opcodes match the first few instructions of the check functions. Set a hook on the positive branch to solve for the register value RDI and store the value. Set a hook on the negative branch to abandon that state. Set a hook at the pre-branch (current instruction) to check if we know the value that was solved for. If we know the value, set RDI so we do not need to solve for it again. Set a hook at a terminating instruction. The state.abandon() call on the negative branch is crucial. This stops Manticore from reasoning over that branch, which can take a while in more complex code. Without abandonment, you’re looking at a 3 hour solve; with it, 1 minute. We’re using Manticore’s context here to store values. The context dictionary is actually the dictionary of a multiprocessing manager. When you start using multiple workers, you will need to use the context to share data between them. The function set_hooks() will be reused in strategy 3: Symbolic solution via address hooking. It sets the pre-branch, positive-branch, and negative-branch hooks. Note that there is a strange update pattern with the values dictionary and target_order array. They need to be reassigned to the context dictionary in order to notify the multiprocessing manager that they have changed. The end_hook() function is used to declare a terminating point in all three strategies. It declares a hook after all the check-character functions. The hook prints out the characters discovered, then terminates Manticore. Since this challenge performs a simple equality check on each character, it is easy to extract the value. It would be more efficient to solve this statically. In fact, it can be solved with one hideous line of bash. However, in situations like this, we can take advantage of concretizing. When a value is written to a register, it is no longer symbolic. This causes the branch to be explicit and skips solving. This also means that the abandon hook on the negative branch is no longer necessary, since it will always take the positive branch due to the concrete value. Set a hook on each character-checking function. Extract the target value from the opcodes. Write that target value to the register RDI. It is easy to extract the value from each function statically. However, if each character-checking function did some arbitrary bit math before comparing the result, we would not want to reimplement all of those instructions for a static extraction. This is where a hybrid approach would be useful. We identify target functions statically, and then solve for the value in each function. Set a hook at the pre-branch (current instruction) to check if we know the value that was solved for. If we know the value, write it to RDI so we do not need to solve for it again. With those three functions we have the target addresses we need. Putting everything together in main() we have a dynamic solver for the challenge Magic. You can find the full code listing here. A run with our debug print statements enabled will help show the execution of this script. The first time the positive branch is hit we see a Reached target [addr]. Current Key: statement and the key up to this point. Sometimes the negative branch will be taken and the state will be abandoned. We see Writing [chr] at [addr]… when we use our previously solved values to concretize the branch. Finally, when the end_hook() is hit we see GOAL: with our final key. Manticore delivers symbolic execution over smaller portions of compiled code. It can very quickly discover the inputs required to reach a specific path. Combine the mechanical efficiency of symbolic execution with human intuition and enhance your capabilities. With a straightforward API and powerful features, Manticore is a must-have for anyone working in binary analysis. Thanks to @saelo for contributing the functionality required to run Magic with Manticore.